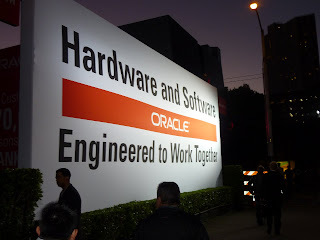 The much-anticipated Oracle OpenWorld 2010 Opening Keynote is underway as I start writing this. The keynote began with some interesting statistics from Chief Marketing Officer Judy Sim regarding the combined Oracle OpenWorld/Oracle Develop/JavaOne conference. There are approximately 41,000 attendees at the overall combined conference from more than 100 different nations. As I blogged upon earlier, this conference is certainly a big deal for San Francisco. Sim also presented several tips for attendees of the conference that included traveling lightly (because a conference this size is spread across many blocks of San Francisco) and getting on the social sites related to the conferences. 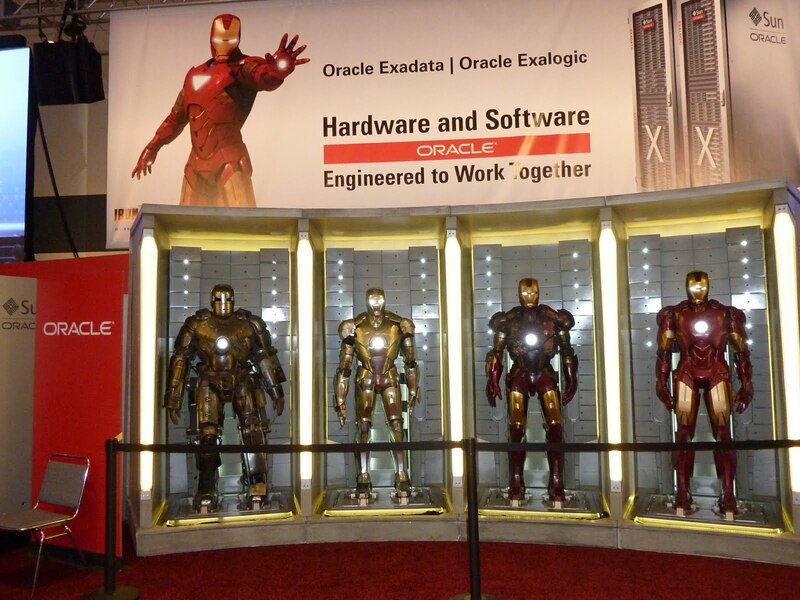 I noted with some interest that attendees can have their photographs taken next to the Ironman suits from Ironman 2. Judy also quipped that they couldn't bring Larry Ellison's America's Cup-winning yacht under the Golden Gate Bridge to be available for viewing at the conference. When the slide was shown with sponsors for Oracle OpenWorld and for JavaOne, I did note that Google is still listed on the slide as a Bronze Sponsor. Safra Catz announced winners of the CIO of the Year Awards and the Oracle Partners. Ann Livermore of HP started her address talking about the large number of customers Oracle and HP share. Her address covered the various products and services that HP has to offer the development community. There was no hint whatsoever of the advertised rift between Oracle and HP mostly recently mentioned in Oracle's hiring of former HP CEO Mark Hurd. The Oracle OpenWorld blog features the related post HP: Leveraging IT to Gain Advantage. HP's David Donatelli talked about the datacenter of the future being converged infrastructure and showed video of customer testimonials. Donatelli stated that HP offers to most complete cloud solution for Oracle. After the HP speakers, some video of ocean waves lapping the shore was followed by quotes pointing out the prevalence of Oracle products in Fortune 500 companies. Frankly, although this is admittedly advertising, I noticed that it seemed to recapture some lost attentiveness in the audience. There was still a lot of discussions going on even after the slides and music and then we saw the waves again with a reference to the 33rd America's Cup (linked reference includes photograph of Ellison holding trophy) in Valencia, Spain. There was a video clip talking about the America's Cup and the winning yacht: USA-17. The footage of preparing for and winning the 33rd America's Cup was, of course, the introduction for Larry Ellison's address. Ellison credited his team for helping him to win the America's Cup on his third attempt. He used their high performance as a segue into talking about cloud computing. Ellison stated that he wanted to start by coming up with a shared definition of cloud computing "or at least an Oracle definition of cloud computing." He also alluded to his own past complaints about the term cloud computing. In his slide "What is Cloud Computing?" Ellison asked if cloud computing is rebranding or innovation and whether cloud computing is an application or a platform. Ellison pointed out that two well-known and oft-cited examples of cloud computing are very different: Salesforce.com's 10-year-old SaaS and Amazon's EC2. Ellison described Amazon's EC2 as a "standards-based platform for application development and execution." He discussed the fault isolation provided by virtualization. Ellison stated that with Amazon EC2 you only pay for what you use. Ellison's description of Salesforce.com's approach to cloud computing emphasized that this approach is not virtualized and that "hundreds of thousands of customers' data" is "comingled in the same database." He pointed out that this can lead to weak security and is not fault tolerant. He also contrasted this to Amazon's EC2 by stating that charge is per user rather than per use. After describing the basic characteristics of Salesforce.com and Amazon EC2 and contrasting them, Ellison stated that Oracle considers cloud computing to be more along the lines of Amazon's approach, though Oracle has added their own twist to the vision of what cloud computing is. The big difference is that Oracle's vision is for a private cloud versus a public cloud. Ellison's description of cloud computing led up to his big announcement: the Exalogic Elastic Cloud platform, a combination of hardware and software or "cloud in a box." It has a total of 360 cores in the box, each interconnected with each other and to the storage device. He also stated that there are no single points of failure in this box and that it "scales symmetrically in a balanced way." He had one of thse standing behind him as he spoke and it was a big box. In a statement surely intended for JavaOne attendees, Ellison stated that the Exalogic Elastic Cloud provides the "fastest Java performance." It is difficult to perform truly representable benchmarks, but these still seem to attract our attention nonetheless. In describing Exalogic Elastic Cloud's "Extreme Performance," Ellison stated that Facebook is up to 500 million users and stated that they could serve all HTTP requests on two boxes (of course, not all 500 million users were hitting it at once!). Ellison said that it served over one million HTTP requests per second and that it served over 1.8 million messages per second in a Chinese messaging application. Ellison broke down some of the technical specifics of Exalogic Elastic Cloud. It has 2.8 TB DRAM and Ellison stated that the machine is designed to work with Java Virtual Machines to make Java applications run very fast. Oracle's Exalogic Elastic Cloud makes use of Infiniband network technology. One Ellison slide on "Database Access" had a bullet asserting: "SQLNet over native Infiniband protocol (SDP) maximizes JDBC performance." Ellison stated that there will be a "single patch for Exalogic System" sent to everyone so that everyone is running the same configuration. He also had a bullet stating that "Enterprise Manager automates patch and upgrade procedures." The idea is that it will be much simpler to maintain customers' configurations if they are all the same. If one customer finds a problem, all benefit from its fix. After seeing Ellison's presentation, it was more obvious why the HP speakers talked about the HP data center approach. The discussed HP solutions were somewhat relevant to Ellison's announcement. Ellison showed a slide comparing Exalogic to IBM's Power 795. 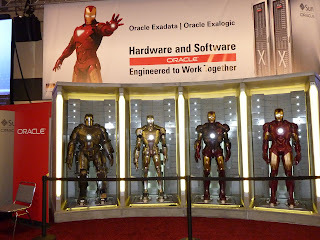 Some of us wondered if Oracle was really serious about getting into the hardware business with acquisition of Sun and other hardware vendors, but this Exalogic announcement and repeated mention of it being a hardware and software solution seems to answer that. Ellison approached the end of his presentation with this focus again: "Hardware and Software: Engineered to Work Together" with the Oracle logo between the two clauses. It was also interesting to see that the Exalogic machine had Sun's logo and Oracle's log on the front and side of the machine. Ellison spent several minutes discussing why Oracle needed to provide their own Linux kernel. The announcement of "Unbreakable Enterprise Kernel" was preceded by explanations as to why Oracle doesn't just use Red Hat Linux. Ellison stated that Oracle spends a lot of time finding and fixing Red Hat bugs (he added that they do this for other operating systems on which Oracle products run as well). He stated that Oracle Red Hat compatible Linux announced was four years ago at an Oracle OpenWorld, but that now it's even more important to Oracle. Besides bug fixes, Ellison also stated that Red Hat is slow to introduce new Linux features and is currently four years behind. This is a problem for large systems such as those hosted on Exalogic. Ellison reiterated more than once that Oracle will always (or long-term) have completely compatible Red Hat Linux, but it was clear that Oracle will now push "Unbreakable Enterprise Kernel." Ellison claimed that Unbreakable Enterprise Kernel is much faster than Red Hat. He did say that Oracle has committed to customers to support Red Hat and that Oracle will keep that commitment. Ellison had a single slide that focused on other announcements planned for Oracle OpenWorld 2010 and JavaOne 2010. These included the already mentioned Exalogic and Unbreakable Enterprise Kernel, but also included the Exadata OLTP DB Machine and Cloud Services. He gave a nod to JavaOne by mentioning discussion and announcements regarding "Java Innovations and Roadmap" and he specifically cited JavaFX vector graphic support. Ellison talked about Fusion Applications finally being ready five years after their announcement. The applications are entirely written in Java and their expected general availability is first quarter of 2011. Also of interest regarding Fusion and the ERP products that preceded it is the fact that they are based on web services. Developers familiar with Java and web services should be able to pick up Fusion quickly. According to Ellison, Fusion will be the first time ever that ERP has been built on industry standard middleware. Fusion applications are based entirely on Fusion middleware. Social networking and collaboration are built in with a modern interface. Ellsion stated that other, existing ERP applications are 20 to 25 years old and are built on proprietary middleware. I appreciated some technical details, though Ellison said more than once that he was advised not to include even these high-level details. I'm happy that he was not talked out of that. I attended this opening keynote in the Hilton San Francisco Ballroom rather than the Moscone Center for a couple of reasons. First, that location is closer to my hotel because it was more important for me to stay near where JavaOne sessions will be held than where Oracle OpenWorld sessions will be held. I also was curious to see how a likely JavaOne-oriented crowd would respond to this keynote. The food was excellent (I especially liked the coconut shrimp and mini quesadillas) and the participants seemed fairly engaged for Judy's brief conference welcome and overview. Based on the volume of conversation around me, I think a lot of the audience's attention was largely lost during the relatively lengthy HP presentations. Those presentations may have been better suited for Oracle OpenWorld than they seemed to be for JavaOne. I also wonder if the less formal, more party-oriented atmosphere of the Hilton Ballroom contributed to our collective loss of attentiveness during some portions of the opening keynote. It was this potential lesser sense of formality that also appealed to me about attending at the Hilton. I thought the beginning and the end of the opening keynote were relatively interesting (though I wasn't as enthused about the ERP/Fusion part of Ellison's talk as the rest of his presentation), but I am sure I was not the only one who wasn't at least just a little disappointed in lack of intrigue in the year of the Google boycott of JavaOne. My overall impression is that Oracle OpenWorld is still the big, popular brother of the co-joined conferences and Google's boycott of JavaOne and the future of Java are not nearly as interesting to Oracle OpenWorld attendees as they are to JavaOne attendees. My hope is that those topics have simply been saved for the JavaOne opening keynote, where they are almost certainly more generally applicable. Cloud Computing is really a great help for the Oracle.